Digital Marketing Blog in India | Digital Marketing Blogger - Ajay Chhabra: Lufthansa Nat Geo Genius challenge. Lufthansa Nat Geo Genius challenge. We are back! Bigger and better than ever, with exciting new features and lots of cool stuff to be won. 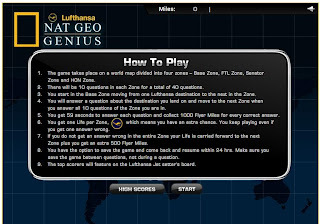 Test your skills and play the Lufthansa Nat Geo Genius challenge. Just invite your friends and win a cool gift hamper. 3) Play the online Quiz game. This is an Online Property of Lufthansa and NAT-GEO and MRM Worldwide is the social media marketing agency for the online promotion. All we need is more and more fans of this Facebook page.